I'm pretty much at the end of the rust repair on my '75 2002. Rockers, gas tank area, floor pans, etc. Wasn't too bad overall. I'm left with rust at the bottom of the nose; the middle is pretty bad, and there's another small spot on the drivers side that is rusted through. i plan on putting a turbo air dam on the car, so this whole area will be covered. So the question is, do I fix the rust... or just cut off the bottom of the nose right below the protrusion? Personally, I would fix it. The nose area is not blessed with a huge amount of structural stability so even if you just do something to close up the hole after cutting out the rust it will be better. It's not hard to fix, and it'll continue to rust if you don't. later about the air dam, you just have to fill the holes. 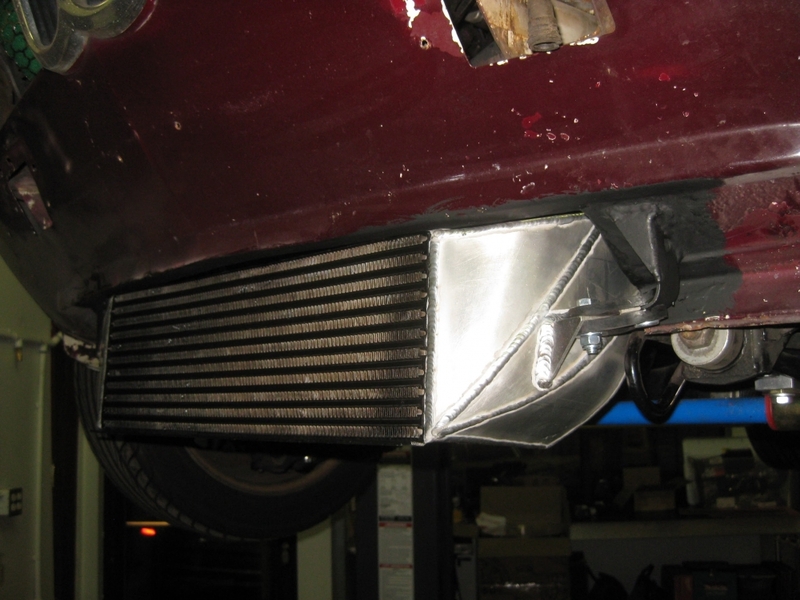 How about replacing that section with an intercooler? The rust there is caused by a dirt buildup in that narrow space at the bottom of the nose where the outer sheet metal meets the radiator support. The dirt stays wet and allows rust to form in the spot welded seam, eventually causing perforation. When you do repair the nose's outer skin (where the rust is), prevent future rust by (1) enlarging the drain holes at the bottom of the radiator support panel (there are a few there, but are too small and easily plugged by a single small pebble) and once that's done, (2) really dousing the seam down inside the nose with anti-rust paint. I would cut off the rusted skin and repair what is under there. 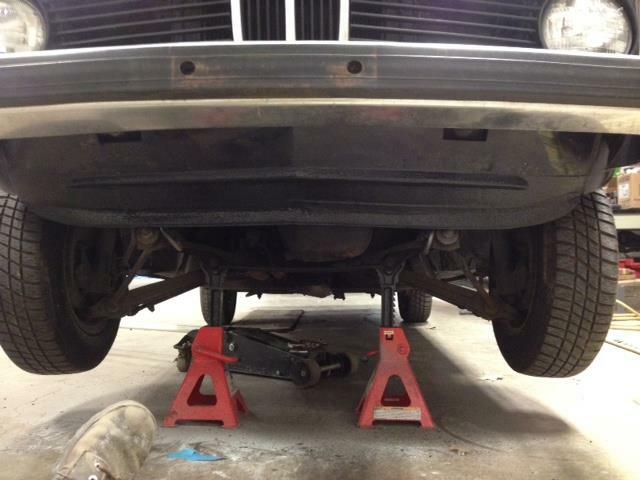 That way you can stop the rust and by not fitting a new outer skin it will be less of a rust trap in future. I was impressed with the volume of acorns, leaves, zip ties, dirt, hose clamps, etc. I found down in the cavities in the bottom of the nose... I still haven't found a good way to get it all out, as my shop vac can only get so far down in there. Check out Jaymic in the UK, they may have the lower patch panel available still. I'd fix it. Not that difficult. Fairly easy to access with grinders and welder. I made the stepped contour using a bead roller, (made two pcs..left and right) and then welded the two halves in place in the center. Once chip-gaurded, it turned out well, I think. I made a crevice tool for my shop vac from the bellows off a clutch master cylinder (any similar bellows will work) and a short length of rubber hose that would fit into the small end of the bellows. I then taped the bellows and hose together, and the large end over the vac wand. The hose (about 5/8" diameter) would fit down into a tight crevice and what wouldn't go through the hose would get stuck to the end by the vacuum, and I could just lift it out. Buy a couple of small flexible magnetic pick up tools and a flexible claw tool. I have a bunch of the flexible magnets, some flexible but rigid like a coat hanger and some that will snake around when pushed. I just used the claw yesterday to retrieve the thumbscrews from the grill that consistently drop down into that cavity. And that little screw or nut you dropped from the engine compartment down onto the chassis crossmember? Using one of these things is way easier than crawling under the car. As for the dirt and stuff, the only thing I can think of is to blow it out.